Before I joined Fitness First in Ras Al Khaimah, I was a bit in doubt if I can really lose weight and transform myself as I was dreaming for years. On my first day, my Fitness First Instructor Kamel Wali, checked my weight and surprisingly that time I reached 136 kilos. Now, the challenge begins on where we start. He gave me proper instructions such as what to eat, fitness regimen, planning our exercise routines, how to execute self-discipline, to increase my fighting spirit as we go on to the process. I enrolled in the Personal Trainer Program and I chose Kamel as I believe in his capabilities. On my first week, I did not lose any weight but it did not stop me. My body is still just adjusting to my new lifestyle. But as we progress, last January 2013, I lost 5 kilos. At this stage, my self- confidence started to increase. We did a variety of exercises such as Free Weights, a wide variety of cardio and abs exercises, Cross Fit (which I literally hated in the beginning but now my life in the gym is not complete without Cross Fit), muscle toning and building. We attacked all different parts of my body (not only concentrating on a particular part) such as legs, chest, back, arms and shoulders because it has to be well-balanced. As for myself, I did lots of sacrifices and the main area was my eating habits. I focused on eating salads, protein-source food, fresh fruit juices and other healthy stuff; taking note that all these are all natural and I did not take any food supplements. 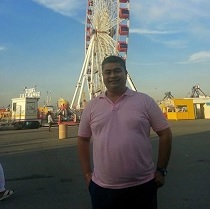 By June 2013, I lost 23 kilos and at that time I needed to go back to Philippines to attend a family event. As I reached the Philippine Airport, my family did not recognize me at all at the arrival area. I was standing across the area in front of them for 15 minutes and they were searching for me. When I approached them, they thought I was another person and they were very happy and surprised because they said I looked fitter and younger (less by 5 years). Then I shared wth them my amazing experience and process that I went through in Fitness First and most especially with the help of my PT Kamel Wali. As we close the year 2013, my total weight loss reached 30 kilos. I did stop as the positive result gave me more motivation. Kamel changed my fitness routines because I reached a ‘plateau” level where my weight loss got stuck. Kamel is so professional, very knowledgeable in his craft and he really boosted my morale and self-confidence. He introduced other sets of training, exercises and techniques where closing the year 2014 we achieved a total weight loss of 40 kilos. I am so happy and I felt like I’m floating in the clouds. I changed my wardrobe from size XXXL (triple extra-large) to be now L (large). My family and friends were so amazed that they started to plan and some of them did join fitness programs. They can’t I believe that I was able to do it. With the transformation I have been through, I am so grateful to Fitness First most especially to my PT Kamel Wali for the patience, trust, encouragement and dedication he has given to me. Also I thank myself for not giving-up and for all the sacrifices. Now it’s a new me, a new Eduard who is fitter, healthier, with high level of morale and self-confidence. Again, thank you to Fitness First Ras Al Khaimah!